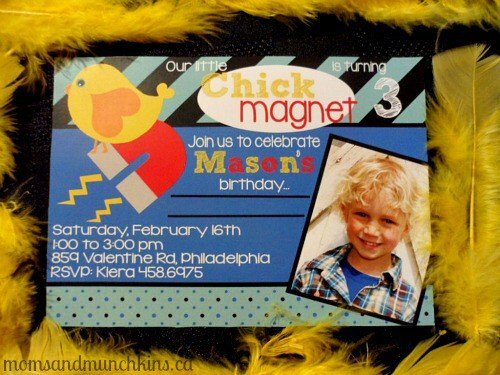 I absolutely LOVE this theme & design from Holly at Mimi’s Dollhouse – a Chick Magnet Party for your little heartbreaker. 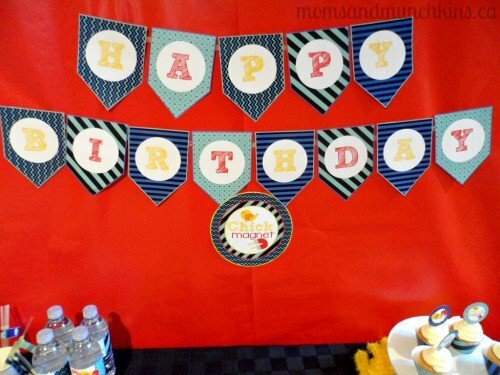 This super sweet birthday theme is perfect for little guys who are celebrating their birthday around Valentine’s Day or any other time of the year. 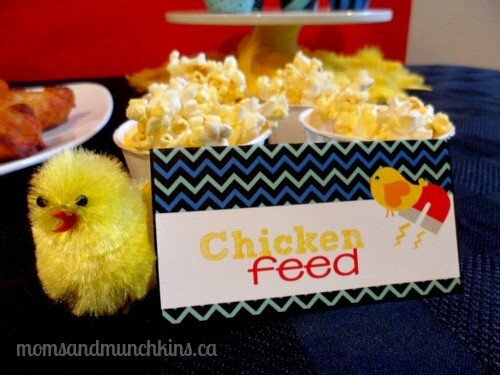 Here I’ll share some party ideas to go along with this theme. All of the printables shown here are from Mimi’s Dollhouse and you can find more information about the set here on her website. One of the many things that’s great about this party set is that it’s available in a DIY printable format. You can print as many of each printable as you need or even save yourself some stamps and email out the electronic invitation. 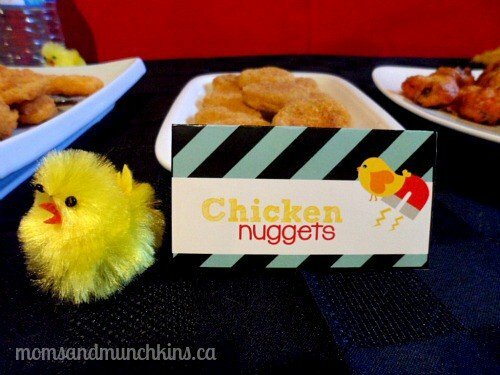 This sweet invitation is perfect for this chick magnet theme. I always love the invitations that include a cute picture of the birthday child. 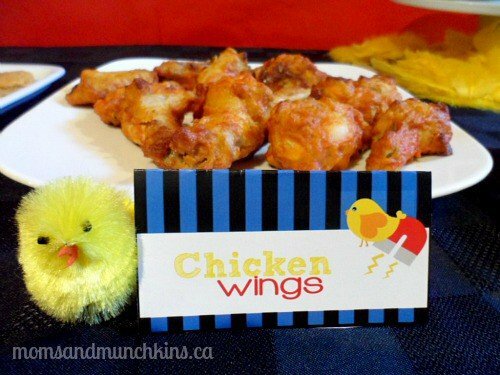 A fun idea is to turn this invitation into a magnet that people can keep on their fridge. It goes along with the chick magnet theme and it’s a great reminder of the upcoming celebration. You can find magnet sticker paper at your local dollar store. This party set includes many pieces to help bring the theme together. 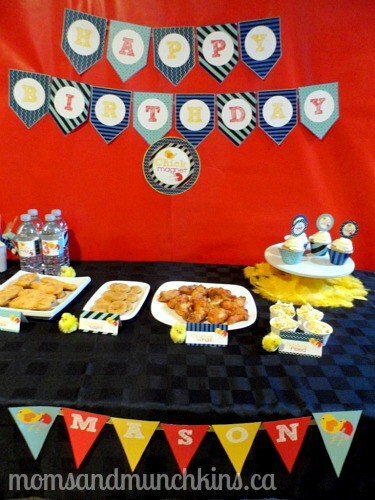 The banner is a great touch for above the food table, the mini banner would look great hanging from the favor table and the straw flags are a cute added touch. You could include the bold colors in other ways as well like a black tablecloth, a red backdrop, dark blue ribbon around your cupcake stand, and balloons in the same color scheme. To add different levels to your food table, simply wrap sturdy boxes in colors that match the party theme and place these on the table as a stand for appetizer trays, tableware, etc. 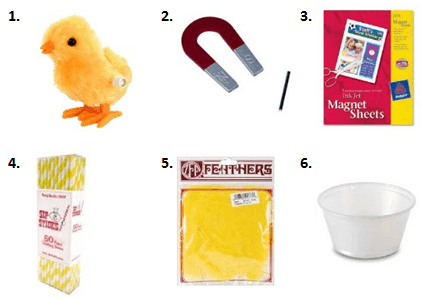 There are plenty of fun game ideas involving magnets and chicks that your little guests will enjoy. Chick Tic-Tac-Toe: In the printable set from Mimi’s Dollhouse, there are small circles designed to go on the bottom of Hershey’s kisses. You could use some of these small circles to play a fun game of Chick Tic-Tac-Toe. Player 1 could be the dark blue border and player 2 could be the second color. 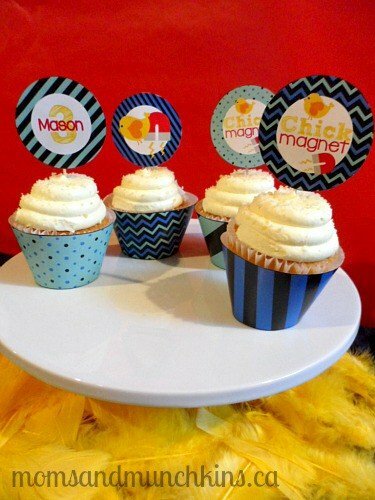 Chick Magnet Darts: This fun idea also includes the circle printables (the small size or the cupcake topper size) and a magnet sticker sheet (from your local dollar store). Simply stick one small piece of magnet on the back of each printable. Using a dry erase marker, draw a dart board on a magnetic white board. 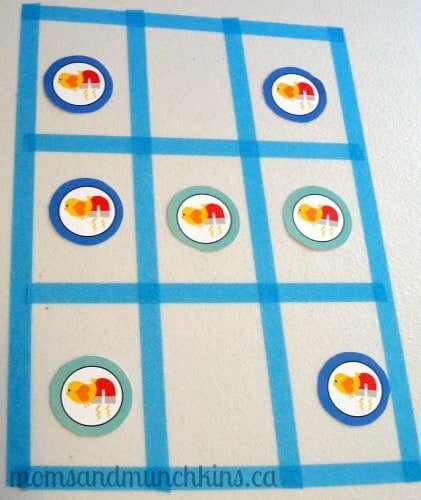 Guests can then take turns tossing the magnets onto the board and earning points. 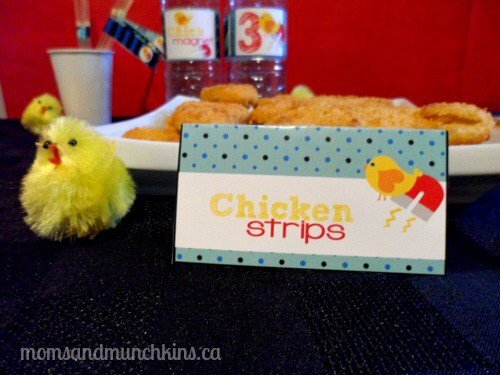 Chick Races: Using wind-up chicks (you’ll have an easy time finding these around Easter), have wind-up chick races on a small table. The first chick to cross the finish line wins! This is more difficult than it sounds since the little wind-up chicks rarely hop in a straight line. 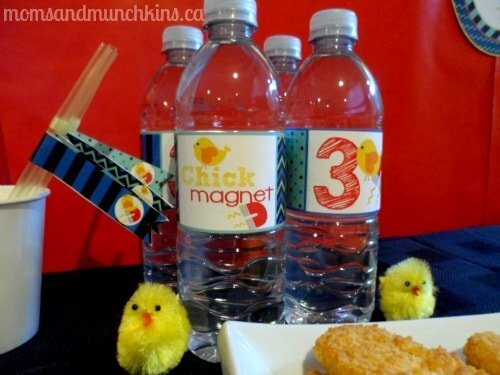 Your drink selections could include water or blue pop with the chick magnet water bottle labels. The straw flags are a cute addition for the drinks. 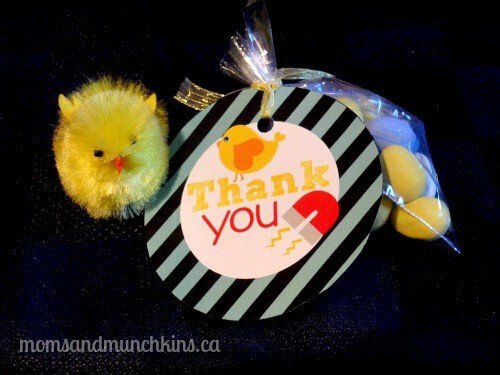 These can be placed in a small cup beside the drinks or lightly taped to the back of each bottle. One of the reasons why I love cupcakes for a party dessert is that you can serve a variety of flavors. The printable party set from Mimi’s Dollhouse includes cupcake wrappers and toppers so it’s easy to tie the cupcakes in with the theme. Some yellow feathers under the cupcake stand are a cute added touch. We sure do love parties around here! Stay updated on the latest creative party ideas by following us on Facebook, Twitter, Pinterest and Bloglovin’. *Disclosure: Mimi’s Dollhouse provided these party printables to Moms & Munchkins free of charge. I am part of the Amazon affiliate program. As always, all opinions expressed here are my own.